AI has been modeled after humans almost since its inception, because the human benchmark for what intelligence is is ourselves. A figurehead of the AI movement was Alan Turing, an English computer scientist who, in 1950, posed the question of whether a machine could imitate anything that a thinking human could do. Turing posed the question in the form of the Imitation Game, which had a person communicate blindly with a person, and then with a machine, and try to figure out which was which. The purpose of the Imitation Game was for each subject to try to convince the interrogator that they were the human – the purpose was to appear human. The Imitation Game, which is commonly referred to as the Turing test, has garnered many opinions, positive and negative, and is not really a useful goal anymore for artificial intelligence because it depends more on convincing people that a machine is human than giving a machine its own intelligence and emotion. Nevertheless, the Turing test has stuck around for decades, because in the tenuously defined world of artificial intelligence, it represents one of the few concrete goals that we have. Chatterbots were some of the first ventures into artificial intelligence, and their goal is fairly straightforward: mimic human conversation. A chatterbot is the simplest implementation of the Turing test. If a chatterbot can convince a human that it is human, it passes the Turing test, whether or not it has any understanding of anything it said or heard. In fact, one of the earliest well known chatterbots was called ELIZA, and it was designed by Joseph Weizenbaum to show just how shallow conversation between man and machine was. Because ELIZA was not actually ‘intelligent’ and could not learn anything, it was programmed with the barest of real world knowledge and communicated mostly by turning a human participant’s words back on them in the form of a question. In programming terms, this is easy – we dissect the parts of the sentence (the subject, the verb, the statement, etc. ), and then we find a corresponding subject value to turn the statement around and we put the pieces together again. “I feel tired” breaks apart into ‘I’ and ‘feel tired’, to which ELIZA might respond ‘Why do you feel tired?’ There is no understanding going on, but the parts of the sentence can be rearranged to make it appear that ELIZA not only understands but cares about the person speaking to it. This was certainly the case when ELIZA first came out – many people had an emotional response and believed in ELIZA’s understanding, despite knowing that ELIZA was only a computer program. Weizenbaum, who had created ELIZA exactly counter to this sentiment, was distressed and shut ELIZA down, potentially depriving the field of AI of some early advancements. Chatterbots have evolved over the years from ELIZA. Every year, the Loebner Prize, an event that seeks to improve AI standards, runs a competition to see what programmer can build the most convincing AI. Entries tend to be chatterbots, as convincing a human they are talking to a human is much, much easier than teaching a robot to pick up a cup in a convincing manner. However, entries into the Loebner Prize reflect the problems of the Turing test that Loebner supports itself: programs that do well in the Loebner Prize judging sessions tend to employ deception and programmers spend more time trying to trick judges than they do trying to develop actual artificial understanding. In some ways, this is appropriate; Alan Turing also moved away from the question of whether machines can think to whether machines can imitate humans. But appropriate or not, painting a human exterior on a program that cannot think does not an artificial intelligence make. 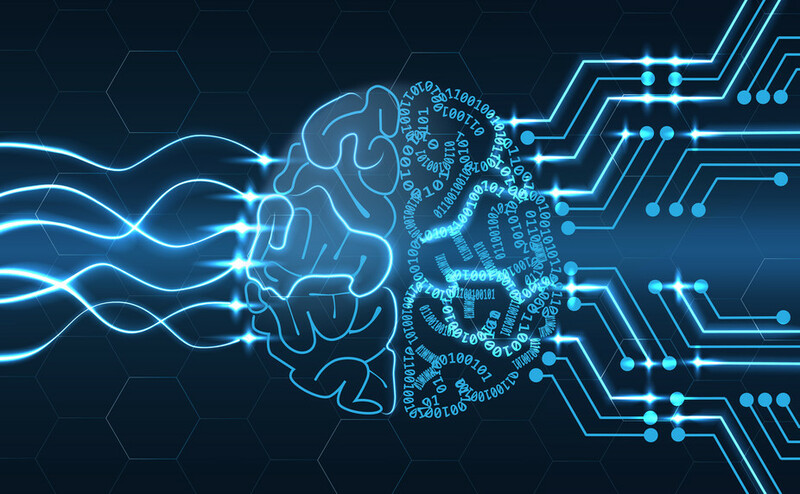 Better advances in AI have come from machine learning and deep learning. (For a good, quick overview of machine learning, you can check out this earlier blog post by Doug.) From the start, programmers have tried to model artificial intelligence after humanity. An early concept was a neural network, which is a network patterned after the human brain. The neurons are values that have various weights and biases to how important those values are, and the connections between neurons represent inputs to other neurons, which have more weights and biases and connections to other neurons, and so on. Neural networks pattern the way human neurons fire, padding information through to try to make sense of it. Early neural networks were somewhat ineffective and didn’t take off, but now, partially thanks to a massive increase in both memory and computing power, neural networks are back in style and working better than ever before. 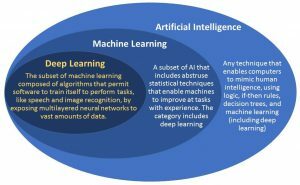 Deep Learning is a subset of Machine Learning, which is a subset of Artificial Intelligence. Deep Learning focuses on teaching software to teach itself. But sometimes AIs training themselves can lead to breakthroughs. Google’s DeepMind created the AlphaGo program, an AI that plays the board game Go. Go has long been thought to be beyond the scope of a program, since there are huge numbers of possible moves and game results at any given time and Go is a game of strategy that requires thinking far ahead. In 2015, DeepMind’s AlphaGo first beat a professional Go player, and each iteration of the project went on to beat better and better opponents, beating the best Go player in the world, Ke Jie, in 2017. All these versions of AlphaGo were trained by reviewing hundreds of human-played games and learning patterns based on that, then sharpening its skills by playing against humans and other Go-playing bots. AlphaGo Zero, however, the successor to the dynasty of robots that play Chinese board games, was given no training data. It was simply given the rules of Go and set to play itself over and over. At first, the moves it played were random, but over a short amount of time, it began learning and making better and more strategic decisions. 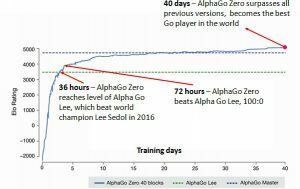 AlphaGo Zero passed the level of the first AlphaGo that beat a professional in only three days, and in just over a month was superior to the last version of AlphaGo (AlphaGo Master), which had been awarded a ninth dan professional rating. As AlphaGo Master beat the best human player in the world, and AlphaGo Zero beat AlphaGo Master, is AlphaGo Zero the best Go player in the world? If a program can be awarded a ninth dan ranking, it very well may be. Of course, AlphaGo isn’t much good for doing anything besides playing Go yet, like our neural network can’t read anything that isn’t a number. In our current state of AI development, most AIs can only do one thing. But they are getting better and better at doing their one thing, and as AI developments filter out into computer science at large and become more mainstream, perhaps soon we will have a robot that can play Go and read a phone number at the same time.